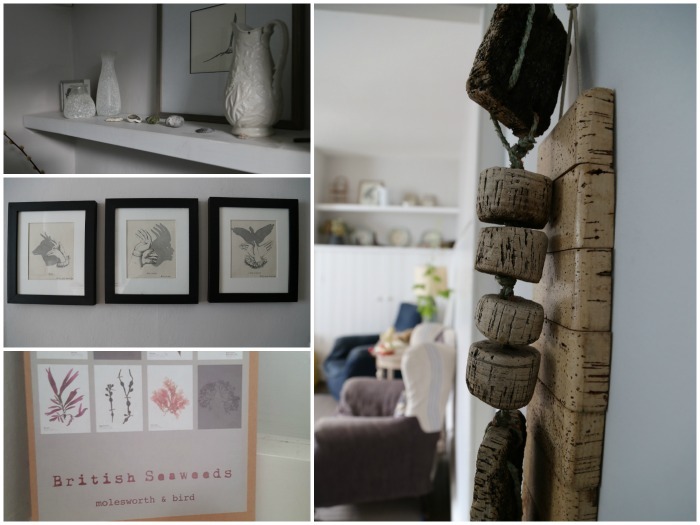 This post contains a LOT of photos, so you might want to grab a cuppa and find a shady spot in the garden before you begin reading. 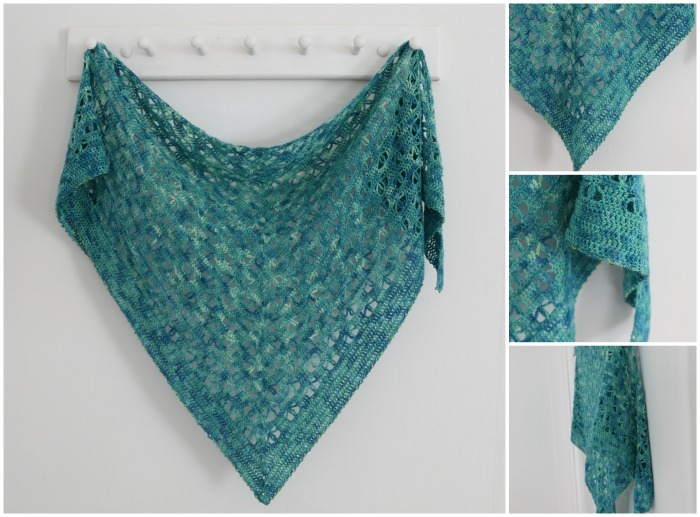 My friend Kay brought along her gorgeous Banksia Shawl, made from the pattern I designed for the February retreat. I love her addition of a simple border and beads, and the colours are a perfect reflection of the sea at Lyme Regis. When we were doing a spot of show-and-tell, it was a pleasant surprise to realize that most of our projects were in similar or complimenting colours. Just look at this rack full of goodness! From left to right: Banksia Shawl (Devon Sun Yarns Sprightly), Kay’s Whirl Mandala Cardigan by Lillabjorn’s Crochet World (Scheepjes Whirl Green Tea Tipple), two My Story shawls (my Whirl Pistachi Oh So Nice one and Lynette’s Whirl Liquorice Yum Yum one), another Banksia (Devon Sun Yarns Sprightly), and Summer Sunrays Stole by Mary Lamont (available in Issue 2 of Crochet Now with Errata available here). I couldn’t resist draping all of them around my neck :) I don’t think this will catch on as a fashion any time soon! 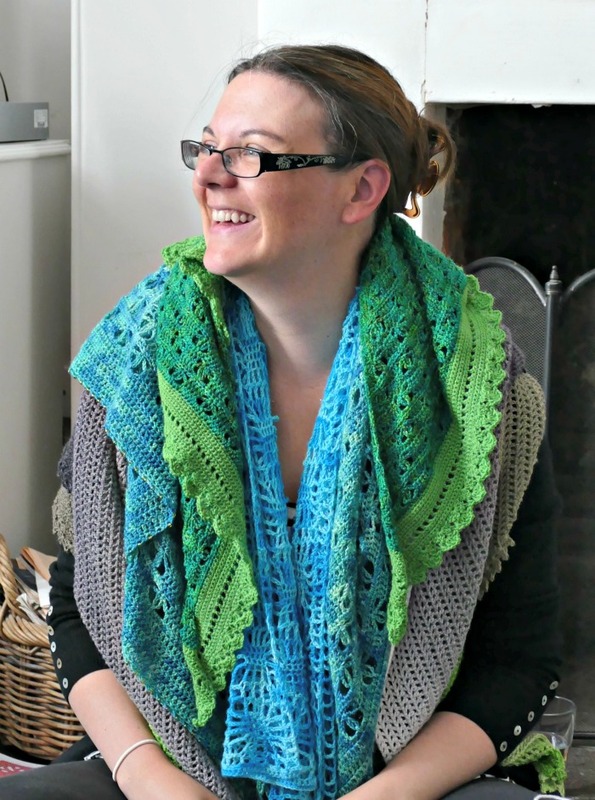 Ps to self: write the pattern for that green border already! The Arched House has become very dear to my heart. 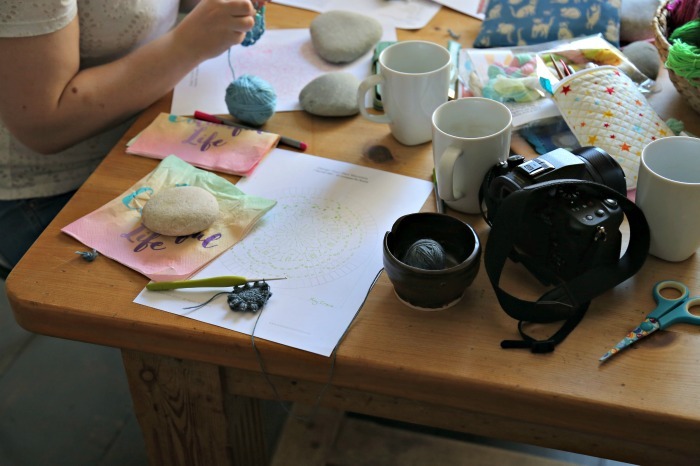 At the first few retreats, I was overwhelmed by the space and the elegant beauty of it. Although it still takes my breath away every time I walk through the door, it now feels like home. I notice when vases and stones have been arranged differently, I say hello to my favourite random pictures (like these shadow puppet ones), and I smile when the stairs creak just so under my weight. This time, there was a little stack of postcards arranged on the ledge in the kitchen. Curious, I walked closer to inspect them and to my delight, Daisy told me that they were for sale. 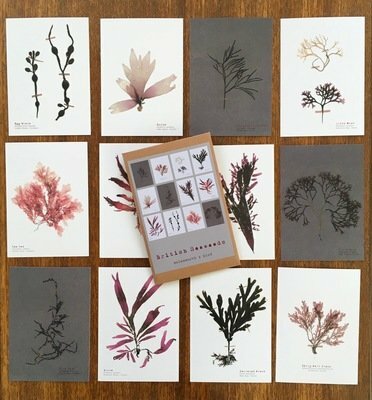 They are the loveliest pressed seaweed postcards from Molesworth & Bird (available to buy online HERE). I fully intended to use them, but they are so pretty that I decided to stick them to my fridge so that I can look at them instead. I didn’t take a nice photo of them, so I’ve borrowed one from their website. As always, the food was delicious and plentiful. 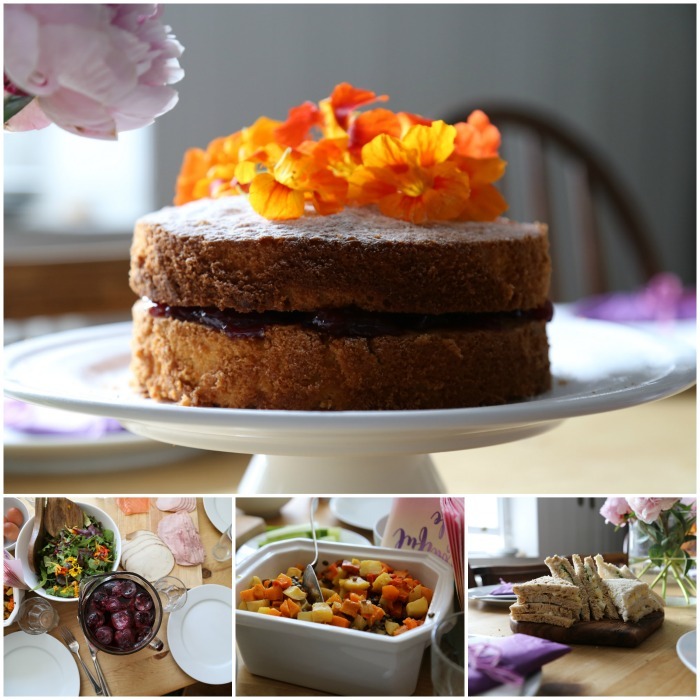 My favourite edible item has to be the gorgeous cake that greeted us upon arrival (and Daisy’s lentil salad, of course!). There is something so satisfying about eating flowers. The flower-filled salad made me wish that summer could last all year round. My favourite non-edible item was (surprise, surprise) also flower-related. Just look at the grace of those pretty petals! 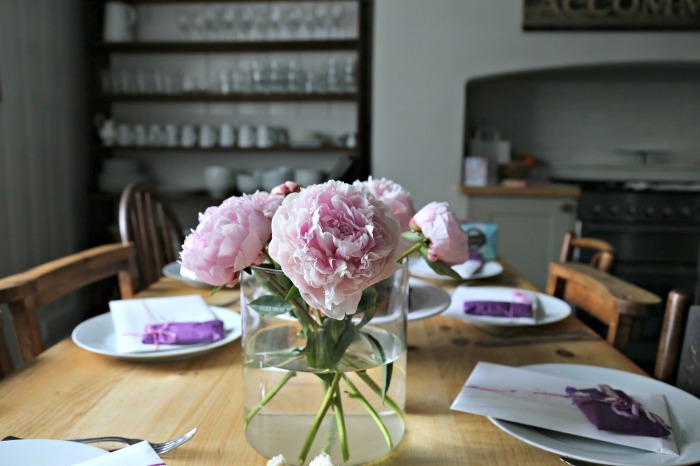 I suppose it helps that the bouquet was on a beautiful table in a beautiful kitchen, surrounded by little presents! I love taking photos of the people at the retreats, especially when they don’t realize I’m taking photos. 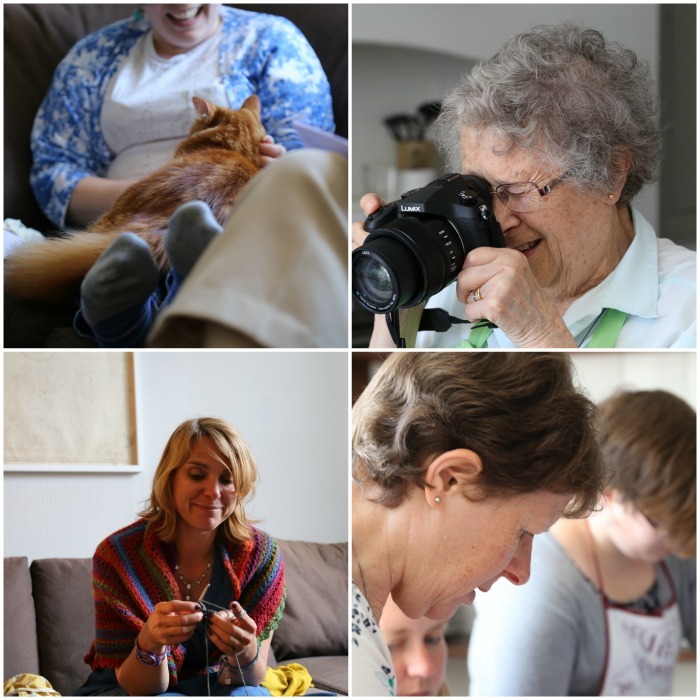 When I look back at these candid shots, I remember random little things like the way the room buzzed with chatter at that moment or the gentle purring of the cat as it hopped from lap to lap trying to find a favourite. Yes, the house has a resident cat, and this is one of my favourite photos of it. 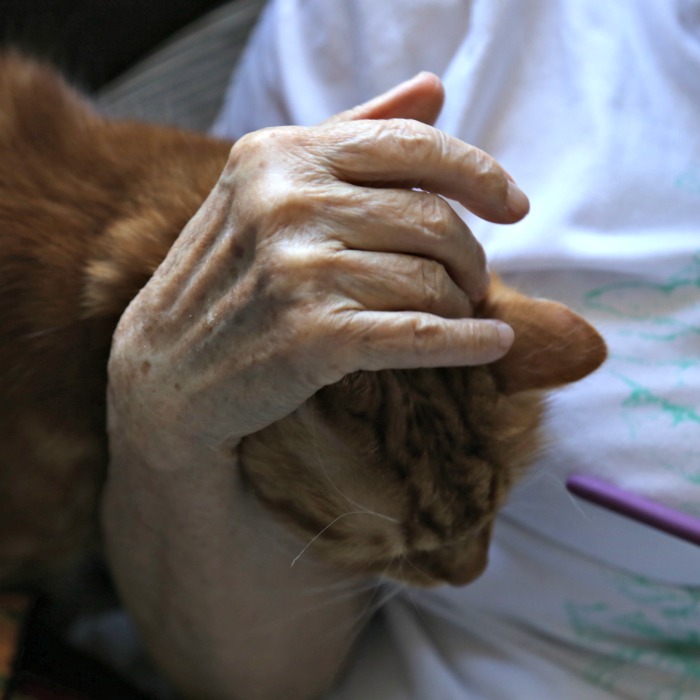 This was Sheila putting her crochet to one side so that she could stroke the cat ever-so-gently. Her hands remind me of my Great-grandma Dollie and the strength that lay beneath the fragility of her hands. One thing I have never done before at a retreat is going for a morning swim. 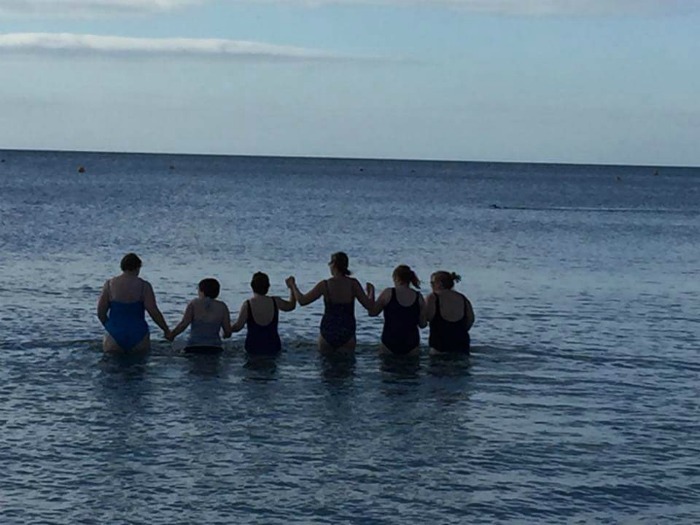 This is us, squealing and laughing, walking into the freezing cold water before beginning our day. I just know that this is one of the memories I will pack away into my special memories box. You probably know Jenny already (@jennybugs66 on Instagram), but in case you need a little reminder, Jenny works with me at the hospital. Over the last few years, she has become my crochet right-hand gal. We often work on projects together and I love her experimental attitude. The Whirl Sophie she is working on in these photos started life because I said: “I wonder what a Whirl Sophie would look like” and Jenny went: “Oooh, I could do that!” Charlotte’s Dream is another pattern that wouldn’t have seen the light of day were it not for Jenny’s eagerness to experiment. I think it is safe to say that she enjoyed her weekend VERY much. I always design a project specifically for the retreats (and yes, I do share them on my blog later). Daisy has a wonderful collection of colours and I find choosing the colourway the most difficult thing about designing the patterns. There are just SO many choices and I want to use them all at once! This time, I decided to mix things up a bit, which made it easier because I didn’t have to choose a colourway, but harder as well because… EEEK! 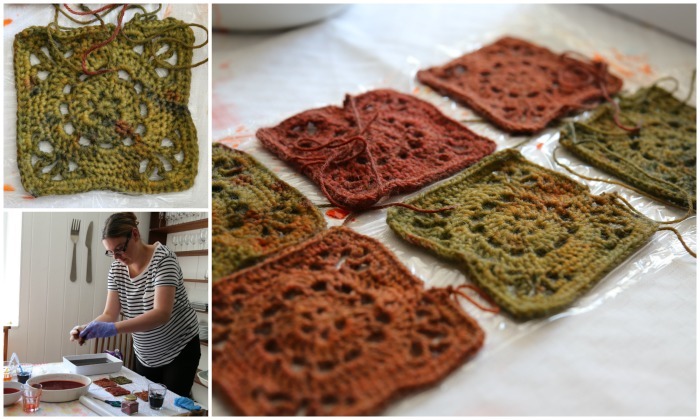 I decided that I would get everyone to make squares in undyed yarn and then we would dye them afterwards. I designed the square in honour of my friend Emma, who is kind and incredibly brave. The square had to be small enough so that the ladies at the retreat could make multiple squares before it came to dyeing them on Sunday. I was quite nervous about this. What if people tried to dye their squares a specific way and then hated the outcome? What if I hated the outcome myself?? 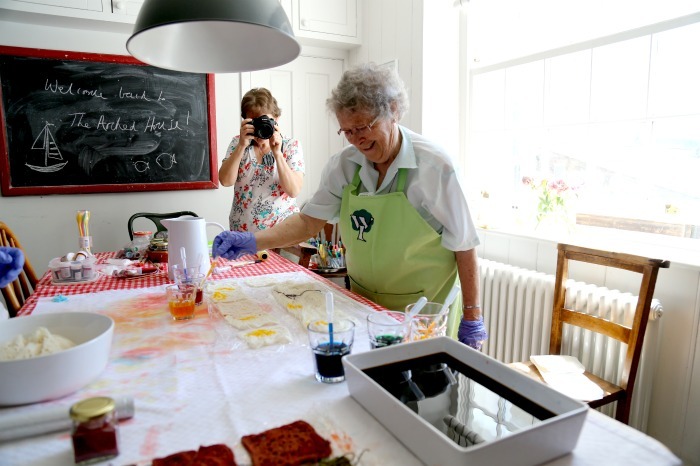 But I do like a bit of a challenge, so armed with ‘virgin’ squares, vinegar and water, food colouring, and my trusty side-kick, I set about experimenting. I started off quite methodically, trying to use ‘recipes’ so that the squares would turn out more or less how I wanted. Unfortunately, 5-year-olds and plans are natural enemies of each other, so I ended up just letting Xander take the lead (with not-so-gentle guidance from me). I wasn’t going to share these photos of my messy ‘office space’ next to the fridge, but just look at that face! It was an incredibly freeing experience and look how well they turned out! I was able to make 10 squares from one 100g skein of superwash merino, which is enough for the front of a cushion with one to spare. Even though the experience wasn’t as daunting as I thought it would be, I was still a little bit worried that the ladies at the retreat wouldn’t like the idea. Of course, I needn’t have worried. They had such a lot of fun! I love this photo of Sheila and Kay (her daughter); love the fact that Kay is capturing her mom’s joy on camera as I capture this memory for them. 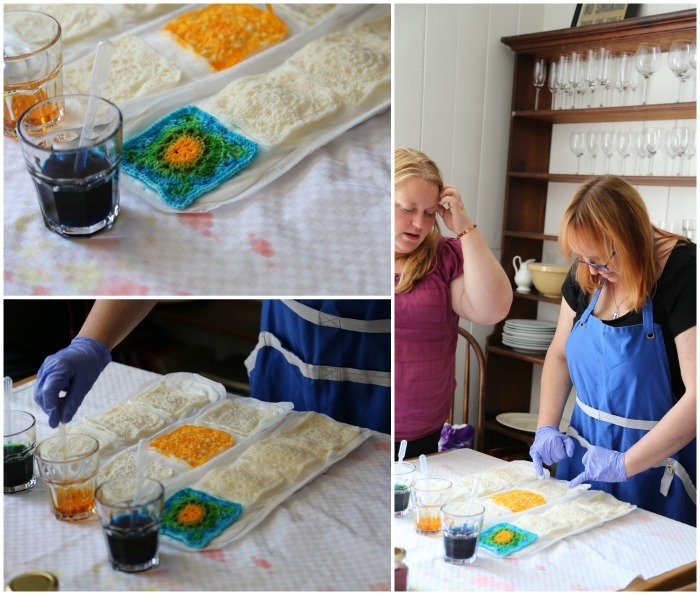 Sheila dyed all her squares the same way – pools of yellow, red, and blue (you can see an example in the collage below). 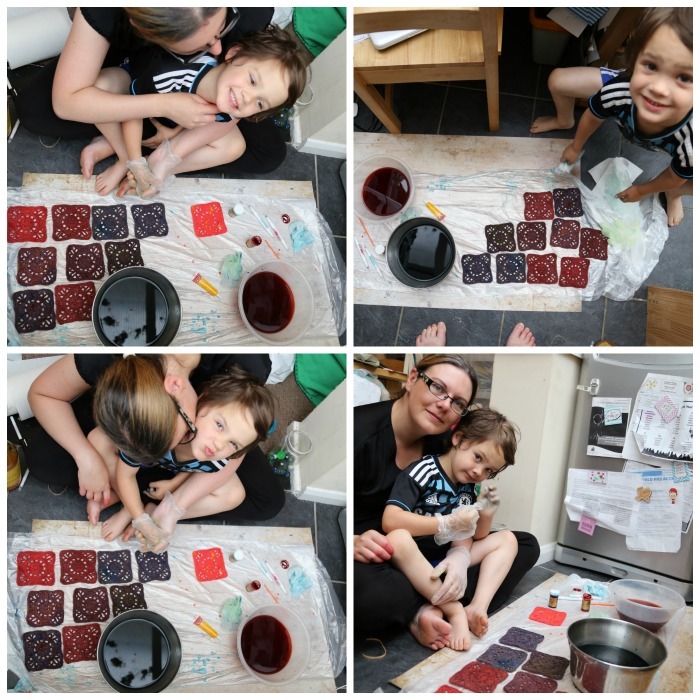 Jenny laid all her squares out in a grid and then dyed them individually so that they would form a ‘picture’. I somehow managed to end up with tarnished-copper squares. 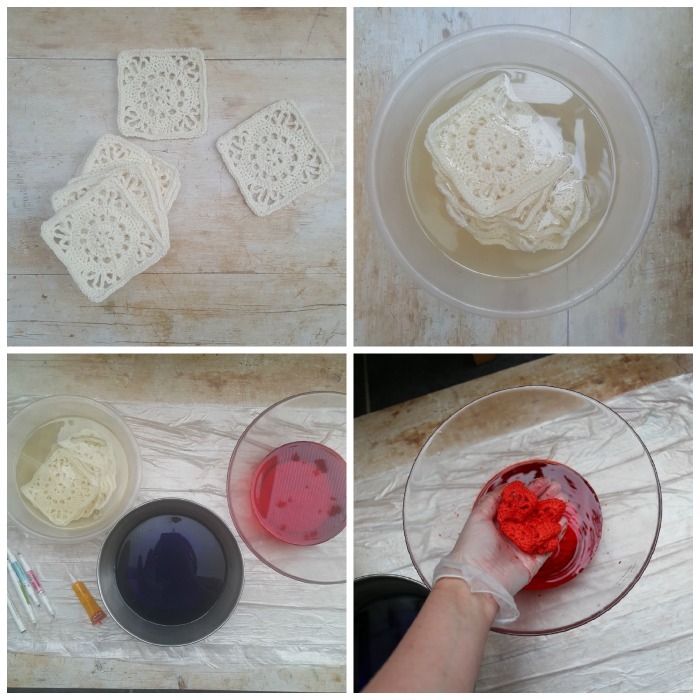 I did this by dipping my squares randomly into other people’s dye ‘baths’. I have no idea how to replicate the look, but I wish I could! I’m not usually a green person, but if you saw these in real life, you’d see that the colours are unique and alive! Here you can see examples of everyone’s squares. I particularly like the graded blue/greens and the blue/purple combo. 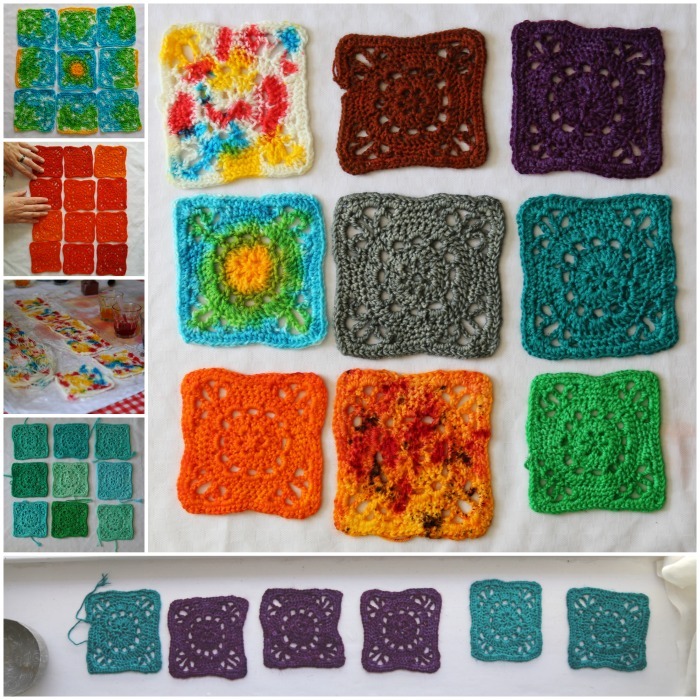 I will be posting the pattern for the Emma square at some point, but if you want to try this at home, you can make any crochet squares in undyed yarn and then dye them yourself. If you want to try a mottled/speckled effect, I suggest using squares that don’t have a lot of surface detail as surface detail becomes lost if the colours are too contrasting/speckled. Will your squares look bad if they have surface texture? Absolutely not! But a square with surface texture requires more work and time than a lacy square of the same size, and I don’t think the extra work is rewarded in this instance. If you are going to try a graduated colour scheme, surface detail will work well as the colours won’t be fighting the texture for attention. Kits – You can buy ready-made dyeing kits HERE from Devon Sun Yarn. Extra skeins/sock blanks are also available HERE. 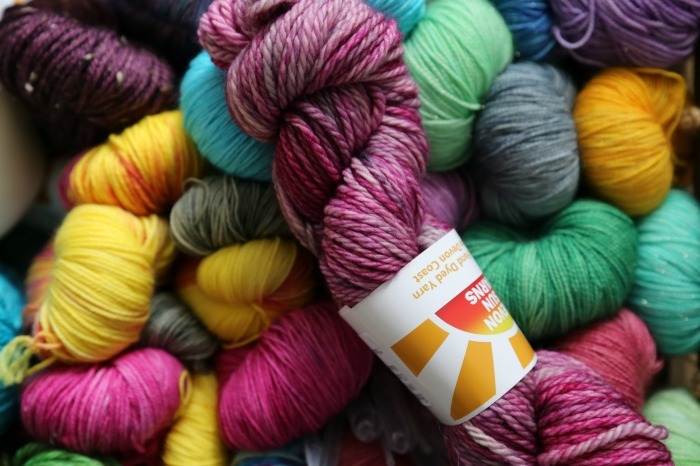 Tutorial 1 – Shiny Happy World has a quick tutorial for dyeing yarn with Kool-Aid. Edit 2018: I am lucky enough to have received undyed socks and packets of Kool-Aid from a friend in the states, so I am keen to give this one a try! 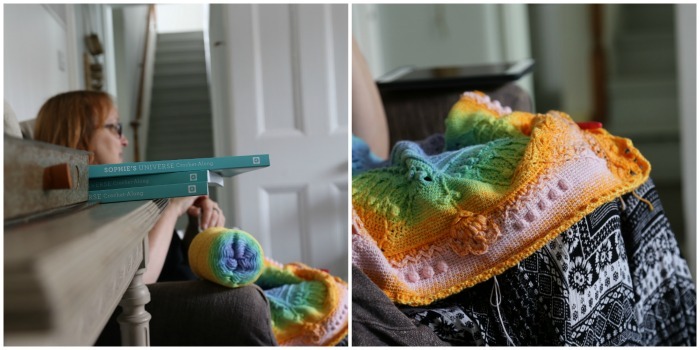 Tutorial 2 – I found a great tutorial on Darn Good Yarn. This is more like the method we used. 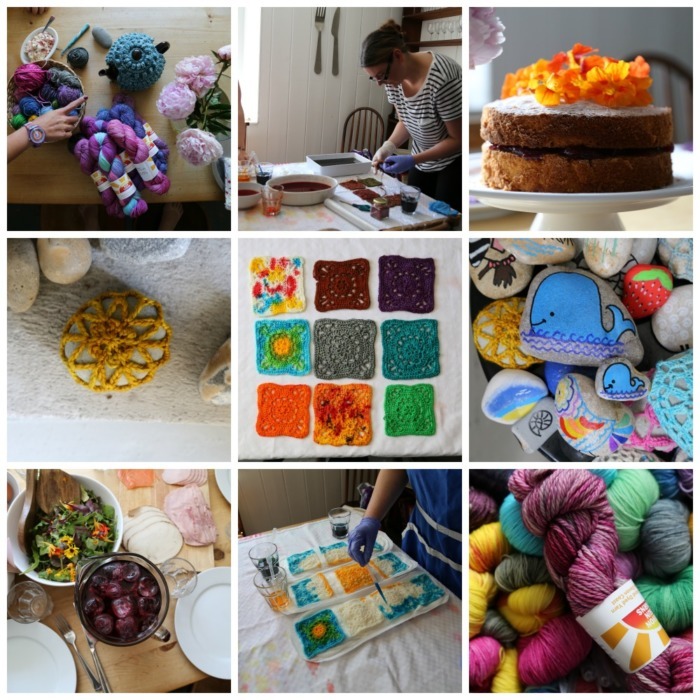 Book – If you are interested in a VERY comprehensive guide to dyeing yarn, Hand Dyeing Yarn and Fleece by Gail Callahan (Amazon UK/Amazon US) is a brilliant book. Amazon offers a ‘Look Inside’ option, which I always like to look at before buying a book. 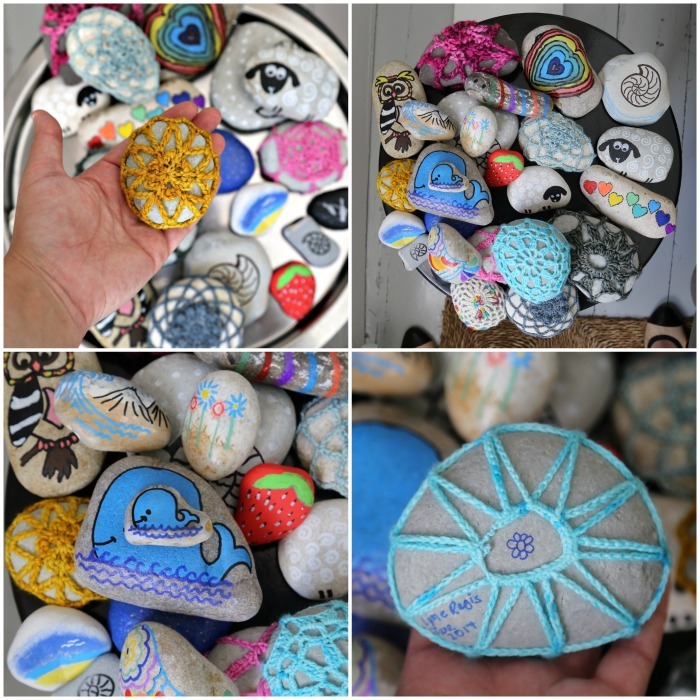 We also did a workshop where we could either paint on stones or crochet around them. I loved the freedom of this exercise as well. I think the theme of this weekend was definitely stepping outside the box and letting your imagination take flight. 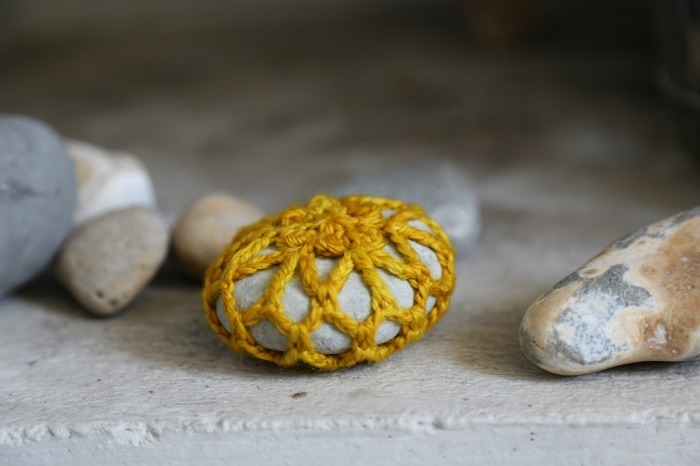 I used a mustard worsted weight yarn to crochet around my stone and I LOVE it. I think it will live on my desk, sitting proudly on top of a pile of papers and samples to begin with and gradually disappearing under yet more papers and crochet paraphernalia. I’ve been working on a ‘Design Your Own Mandala’ template and I needed some feedback on it, so when there was a lull in activity, we gathered around the kitchen table and played around with the templates. It was very interesting to watch the different approaches. Some people just had a bit of fun with it, other people wanted to get it ‘just right’ and found the experience frustrating, and others took to it immediately. After ‘testing’ this on them, it is clear that I will need to do a lot more work on this project before I can present it to all of you. Now I am back home, sitting in my messy ‘office space’ drinking Lemon and Giger tea. It already feels like this weekend is a distant (treasured) memory. I can’t wait for the next one! In the meantime, I will dream of living by the sea in a town full of crocheters. Goodnight all!